"The supreme accomplishment is to blur the line between work and play." A couple years ago on a particularly gloomy day I found a book on the sidewalk that someone was giving away, it was the best seller that has since become a book you’ve probably seen everywhere: The Happiness Project. I wrote a blog post over on Kate Asana a year ago about an element in the book that related to yoga. 1. Resist the urge to “treat” yourself. Often, the things we choose as “treats” aren’t good for us. The pleasure lasts a minute, but then feelings of guilt, loss of control, and other negative consequences just deepen the lousiness of the day. I get what she’s saying, buyers remorse, or the guilt that comes for over indulging in in a bad habit, but for someone like be who always has an inner monologue of “you probably don’t need that” a little treat when you are feeling lousy does feel good, and besides a “treat” for me means a glass of wine or a cupcake or maybe a $20 purse, it’s not like I’m ordering bottle service or buying $500 shoes. 2. Do something nice for someone else. “Do good, feel good” – this really works. Be selfless, if only for selfish reasons. I can totally get behind this one and so can science (in a study, people who were given $20 to spend on someone else were happier than those who had $20 to spend on themselves). It feels great to do good things, who cares what the motive is. 3. Distract yourself. At the worse times in my life (death of family, loss of jobs, break ups) I have needed to cry, to yell, I have needed someone to listen to me, but I have also needed someone to make me laugh and watch TV with. Yes, ignoring problems doesn’t make them go away, but your brain and nervous system needs a break. 4. Seek inner peace through outer order. and 5. Tell yourself, “Well, at least I…” and 6. Exercise is an extremely effective mood booster. I think these three go together, since they are all essentially saying the same thing: when you feel like you have no control, do something that you do have control over: cleaning, running, cooking. -Exercise is a great one because it occupies your whole body and you’ll feel better about yourself after. 7. Stay in contact. When you’re having a lousy day, it’s tempting to retreat into isolation. Studies show, though, that contact with other people boosts mood. So try to see or talk to people, especially people you’re close to. This is one of the great things about being married/living with a loved one–you have a built in person that will listen to and care about your day and your feelings. You get to talk it out, then you can retreat to the bed or bathtub and have your alone time. 8. It’s a cliché, but things really will look brighter in the morning. Go to bed early and start the next day anew. Also, sleep deprivation puts a drag on mood in the best of circumstances, so a little extra sleep will do you good. Sometimes the best thing to do with a bad day is end it ASAP. 9. Remind yourself of your other identities. If you feel like a loser, an idiot, a failure, etc, all of those things that everyone (me) feels about themselves (myself) sometimes, it’s helpful to remember the areas of our lives that we aren’t currently screwing up–my nephew for example thinks I’m pretty awesome. 10. Write it down. Sometimes it helps to just get it out, you can always delete it or throw it away, or dramatically burn it after. 11. Keep perspective. and 12. Be grateful. Remind yourself that a lousy day isn’t the end of the world. Chances are that this won’t matter in a month/year/ decade, you might not even remember it. And if you do, it might make for a great story once you have some distance. Probably, things could be worse. In fact things could (almost) ALWAYS be worse. One of the many great things about summer is all the free outdoor yoga classes (yes, mine included…). I’ve done yoga in Times Square, Prospect Park, Coney Island, and today after work I walked two blocks and took a great yoga class in Bryant Park. Its good to take your practice outside, experience the interesting mix of peace and distractions, and try out different teachers. Yeah, that’s right. It wasn’t happening. I’ve been doing yoga for 7 years, and this was nowhere near happening. And I wasn’t alone, there was probably 2 out of the 200+ people this was happening for (and even for those 2, it lasted for about 10 seconds). I have always thought of these as “show off” poses, and I’ve been fine with the idea that I’ll never reach them, I’ll give it a shot, but it’s not for me. And maybe I’m right, but maybe not. Who knows. Like I said the yoga pose isn’t the point. It’s what she said when we were all looking at her like she was crazy. Something might look crazy, something might seem impossible, but sometimes if you keep plugging away at chaturangas, or writing, or running, or sewing, or holding your breath underwater, or baking, and one day you are in that crazy arm balance, or have finished a novel, or ran a marathon, or made a skirt, or are swimming laps, or made a cake. Sure it’s a cliche, Rome wasn’t built in a day, if at first you don’t succeed try try again, but cliches are there for a reason. And so what if it’s cheesy, some days it might not work, but some days a thought like this may be just the reminder you need. I read this blog post the other day about committing 15 minutes a day to writing, she makes a lot of good points in it, one being that “Repetition builds momentum.” Its hard to find a large block of time to write, so you don’t do it and then weeks or months go by with no progress, but a few minutes a day, and you have a chapter in a few weeks. 10. Care to come back to my place for a little Dickens? 9. When you’re tired of dating “speed readers” call on me. 8. You’re pretty nicely stacked yourself. 7. Have you seen a copy of Tax Tips for Billionaires? 6. Who’s your favorite Karamazov Brother? 5. I’ve got a great reading light next to my bed. 4. I can bench press a whole stack of James Michener novels. 3. While you’re turning those pages, mind if I lick your finger? 2. You’re hotter than Emily Dickinson in a tube top. 1. Is that an unabridged dictionary in your pocket, or are you just glad to see me? Hello Is it Me Your Looking For? Remember me? It’s been a couple of weeks since my last post, but I swear I have a good reason. I got a new job!! On August 1st I started as an Associate Editor at Entrepreneur.com . I’ve very excited to be working full time again, and I’m really enjoying it so far (I must know what I’m doing with this whole blogging thing, since a large part of my job is editing their blog!). 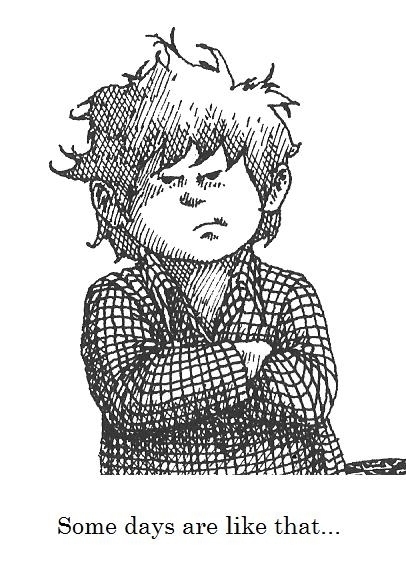 Of course this change in my schedule means that I probably won’t be posting here as much, but I love having an outlet for some of my many Katastrophic Thoughts, so I’ll try to make and stick to a revised posting schedule. I’m thinking twice a week is probably doable. I took a 5 week sewing class at Brooklyn Yarn Cafe, and learned to make a tote bag, pajama pants, an apron, and a skirt. I even bought a sewing machine and have been doing a few simple things, I’m by no means even intermediate, but I know how to sew a little now. this is the skirt I made! 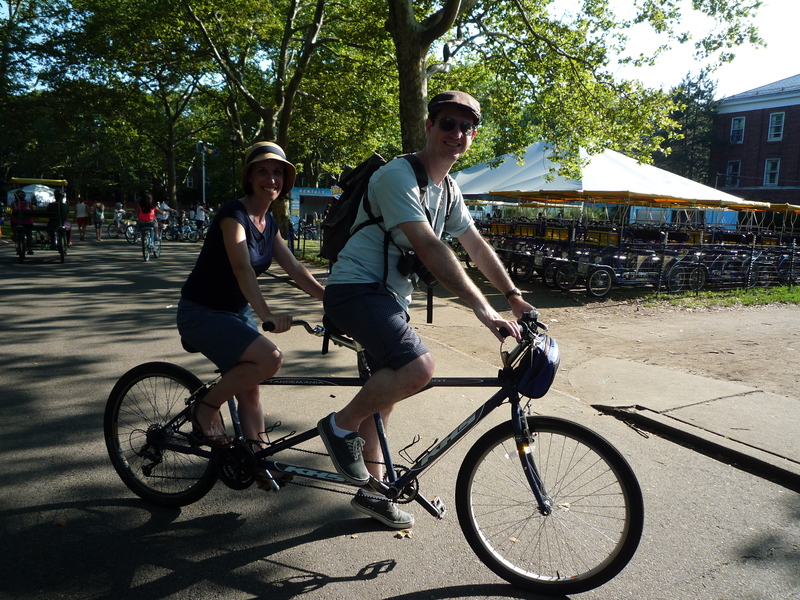 I also FINALLY convinced Mark to ride a bicycle built for two–we rented one on Govenor’s Island, but another couple stole it from us and we almost missed our chance–until Mark said “but it’s her life long dream!” It was fun, but it turns out tandem bikes (or at least this one) are inherently sexist–the woman HAS to ride in the back (talk about a metaphor on wheels) I will now make it my person mission to have this injustice rectified. 2) I participated in The Great Urban Race, it’s a large scale scavenger hunt all around the city–nearly 900 people competed. My team was the “Pre-existing Conditions,” it was disappointing compared to years pass since two of the clues were printed wrong leading all of those 900 people to the wrong locations (this is why editors are so important!) and a lot of the challenges were more about the sponsors’ products than mental or physical challenges. It was still a fun day, and even though we finished in a not so great time, we won 64th place which because of a deal with a sponsor who I am not getting paid to name, means we could go to the national championship in Las Vegas (if we pay for ourselves…so no thanks). Since the race hasn’t owned up to or apologized for how they botched this year’s race, I think this might be our last year. 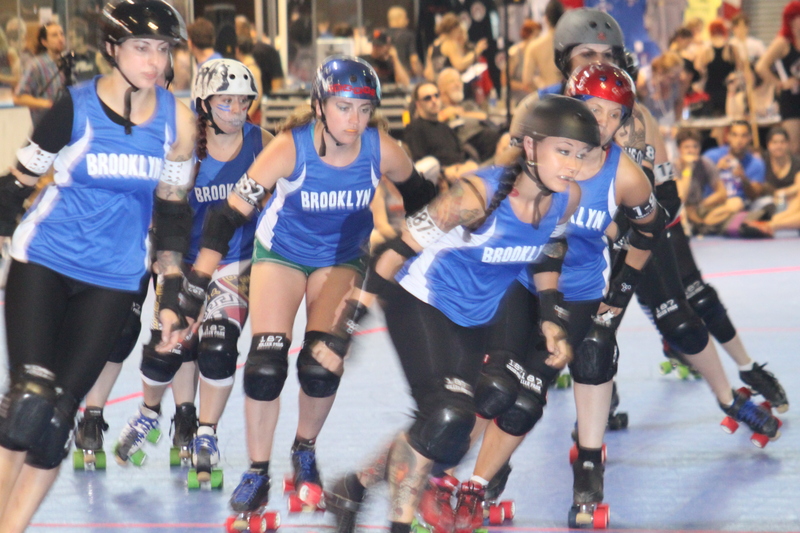 The Brooklyn Bombshells in Action! 4) I’ve been teaching yoga in the park. I’m teaching open level donation based Vinyasa classes in Prospect Park every Sunday afternoon in August at 3pm. If you are in the city, click the link for all the details. I’m donating all the money to the YMCA Strong Kids Campaign. 5) I’ve been doing lots of other fun New York City summer stuff, including seeing Into the Woods at Shakespeare in the Park in Central Park. It was the best play I’ve seen in recent memory, if you are in the city, brave the early morning lines and get FREE tickets! We also got our wedding pictures back–more on that over on the wedding planning blog eventually, but in the meantime here’s one. Spring Forward With the New Issue Of Katastrophic Thoughts!